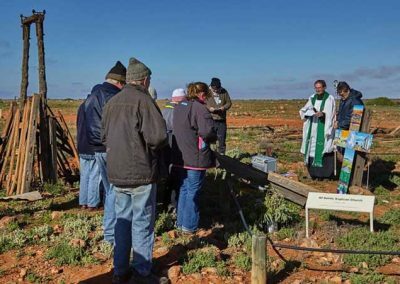 On Wednesday 24th June 2015 the Reverend Trevor J Briggs from Christ Church Kadina (of the Anglican Diocese of Willochra), paid Farina a visit to bless the remains of the original Farina Church of England. Reverend Briggs and his party joined volunteers for a “tea break” before the ceremony (conducted in clear, but very blustery conditions). Before leaving he also indicated his willingness to try to facilitate a suitable information board for the Church site, and possibly supplying a bell (or facimile) for the ageing bell tower. ” In 1882, Farina (had) a multicultural feel. Aboriginals camped in their wurlies along the creek; Chinese cultivated much-needed fresh vegetables along the town’s outskirts; and the town’s largest minority group, the Afghans, with their corrugated prayer shelter and ritual bathing house, perched in their own quarter on a windswept hill above the town and the railway. 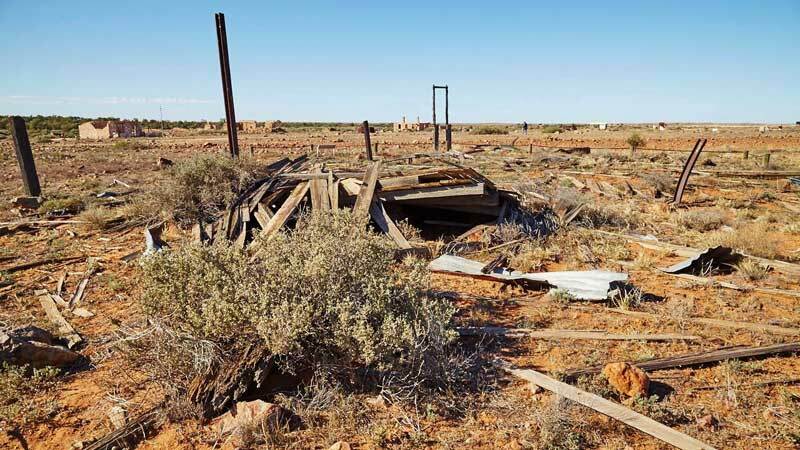 In 1884, when the railway was extended to the town of Marree, Farina began its inexorable decline and Farina became just another stop on the way. By 1911, the townspeople fought a constant battle with the physical elements and struggled valiantly to maintain the viability of the town. Community was the key to emotional survival and it was a fragile concept for many such as the schoolteacher of 1918, Arno Nietz. In letters to his parents in leafy Adelaide, Arno chided them for their lack of communication. “I can assure you it is most disappointing when no letters come that a fellow is likely to imagine all sorts of things. In this Godforsaken desolate hole one is buoyed up thinking ‘mail tonight’”. His remedy for loneliness was involvement with the community and he (Arno Nietz) became secretary of the Race and Tennis clubs and superintendent of the Anglican Sunday school. 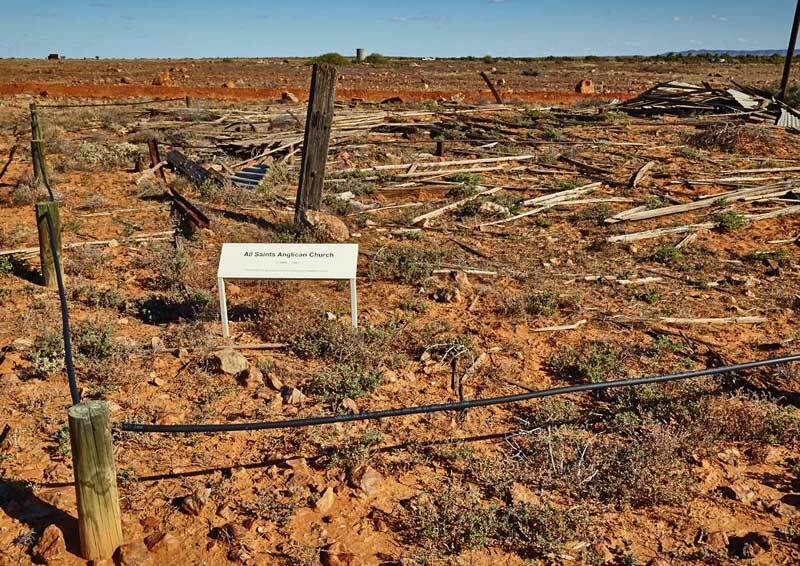 In the 1960s and ’70s, the gibber plain almost reclaimed the town. 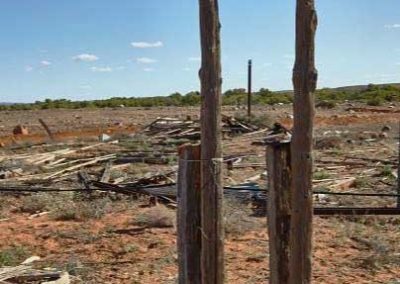 The railway moved to the west, the road to Marree was re-routed to the east, while the Strezlecki Track, reopened to service the Moomba gas fields, now ran from Lyndhurst. Jack Bell closed the only store when a willy-willy tore off its roof. 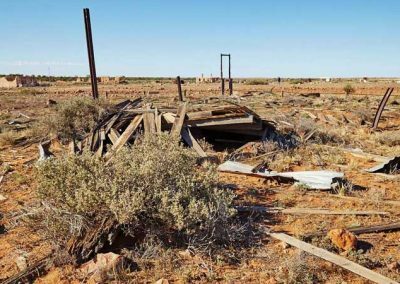 The few school kids left in the town were bussed to Leigh Creek, 60 km to the south. 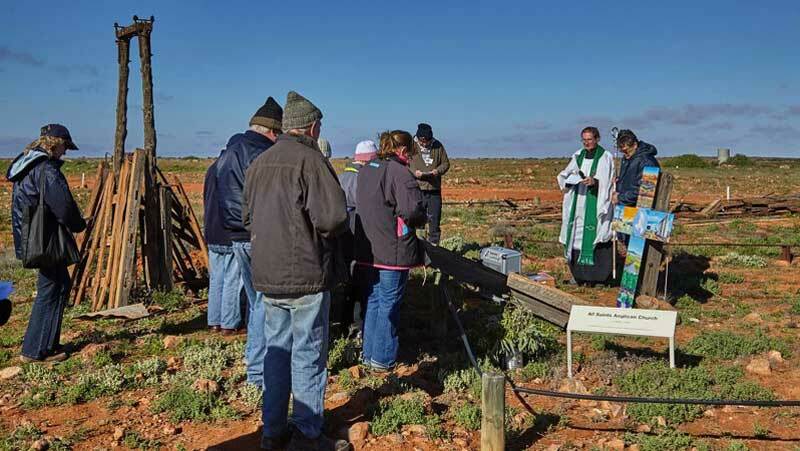 The Roman Catholic church was moved to Goolwa, the Anglican altar to Leigh Creek and bevelled stones from the Exchange hotel were used in Marree’s Madigan memorial. The Pattersons, running sheep and cattle on the adjacent Farina station, won the title of the ‘town’s last residents’. 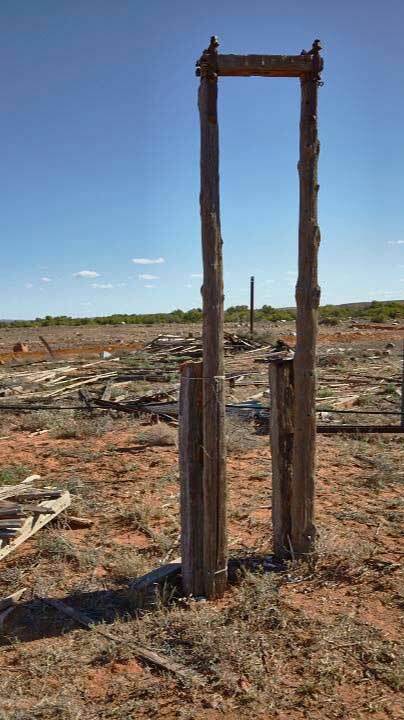 For many years, the sun-baked, hollowed ruins of hotels, post office and police station along with the detritus of car bodies, wires, fence posts attracted only the curious. However, in recent times, Farina has undergone something of a renaissance. In 2008 The Farina Restoration Project Group was formed to restore parts of the town. All Saints Anglican Church at Farina was opened in 1890 and sold in 1967. 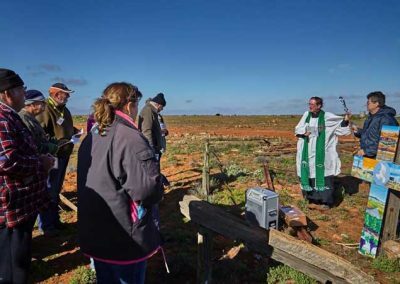 Corrugated iron went to local bidders, the altar to Leigh Creek, and the font to Carrieton. When Carrieton closed, the font was relocated to Port Pirie where it is presently in the Cathedral Church of Saints Peter and Paul. 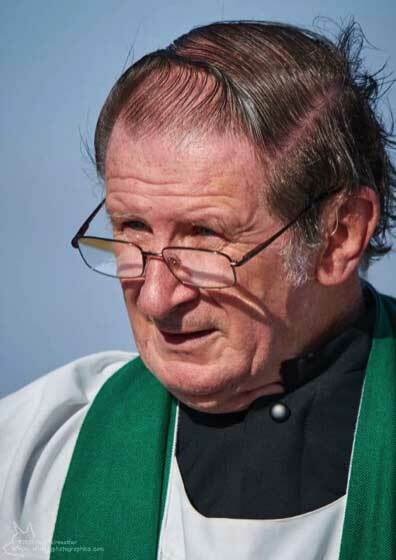 The incumbent priest when the Diocese of Willochra began was the Rev. 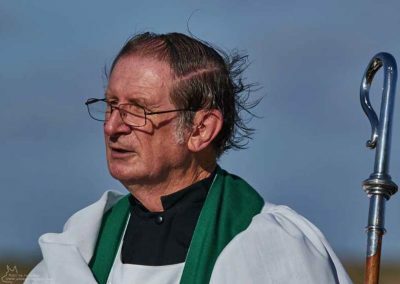 Fitz John Huey who had been commissioned as priest in charge in the northern areas. He was also appointed (by the South Australian Government) as a member of the School Board of Advice for Farina. 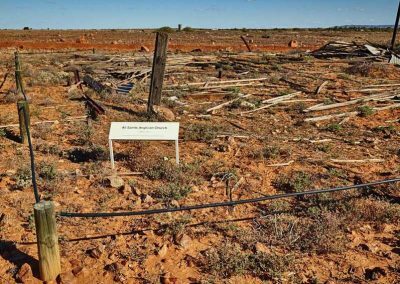 Records indicate that he conducted wedding ceremonies not only in Farina, but also in Blinman and Oodnadatta. 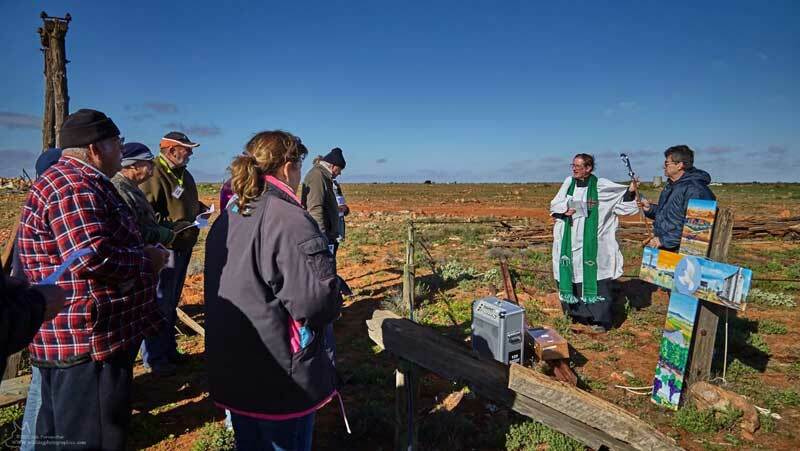 A marble cross, erected following subscription, was erected over his grave in the Quorn cemetery and unveiled by Bishop White on May 31st, 1918.